The emergence of these problems just a dozen years after the start of the euro in 1999 was not an accident or the result of bureaucratic mismanagement but the inevitable consequence of imposing a single currency on a very heterogeneous group of countries, a heterogeneity that includes not only economic structures but also fiscal traditions and social attitudes. The graph below (which many blogs have linked to recently—including Planet Money and the BBC) shows that after the creation of the single currency system, many believed that a single currency also meant the risk of sovereign debt was the same across counties. The financial crisis revealed that the political and institutional difference between countries yielded widely differing performance. As Feldstein explains, the Euro was born out political compromise of (the Maastricht Treaty) in 1999 that created the European Monetary Union and established the political process leading up to the adoption of a single currency. Germany initially resisted this move to a single currency, reluctant to give up its stable Deutschemark. France and other countries however succeeded in pushing the move forward. To get Germany in on the deal, the treaty gave the European Central Bank (ECB) particular characteristics, including formal independence, a single policy goal of price stability, a prohibition on purchasing bonds from member governments, and importantly—a “no bailout” rule for countries that became insolvent. So what did the shift to the Euro do? Essentially it acted as an internal price control allowing internal interest rates to fall in countries where previous expectations of inflation kept those rates high (Spain, Italy, etc). Governments in those countries increased their borrowing to finance growing budget deficits that came with larger social transfer programs. The result was rapidly rising ratios of public debt to GDP in the PIIGS (Portugal, Italy, Ireland, Greece and Spain). 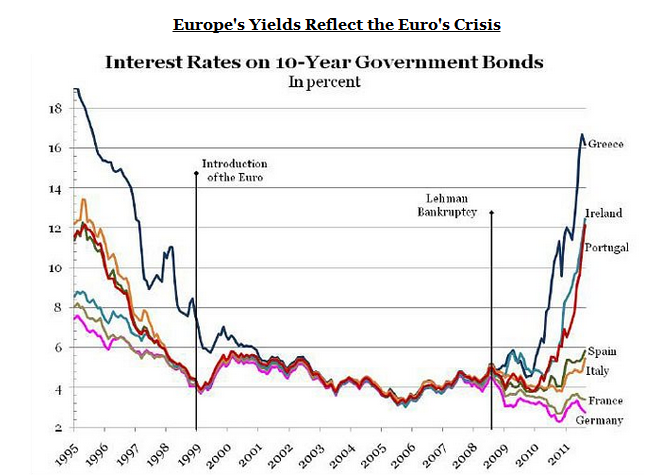 As the graph shows, the bond market at the time viewed all bonds issued by Euro countries to be equally safe. Global capital markets did not raise interest rates on countries with rapidly increasing debt to GDP ratios despite of the increase risk associated with this pattern of fiscal performance. 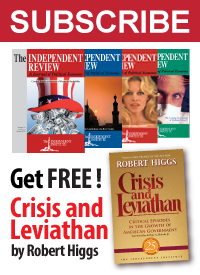 In short, the markets called bluff on the “no bailout” provision of the Maastricht treaty. The minimal divergence between the interest rates on Greek and German government bonds before the crisis reflected the belief that at the end of the day, there was no credibility in the “no bailout” clause. Germany and France were expected to cave. And they did. When countries have competing currencies, a single country can allow the value of its currency fluctuate and respond to changes in domestic and foreign market conditions. For example, if Greece had continued with the drachma, a fall in foreign demand for Greek exports would cause the value of the drachma to fall. Greek goods and services would become cheaper relative to imports, creating an increase in demand for domestic goods and services. More importantly, currency competition places a natural check on the ability of a government to debase its currency and monetize debts. The importance of currency competition is an idea stressed by Hayek and elaborated in much of Larry White’s work in monetary economics. The ideas of currency competition come from a public choice paradigm that challenges how political economy is discussed and implemented. Most economists assume that once a particular solution can be agreed on as the best course of action, that governments could and would implement it without perversion. Rarely are incentives of political actors included in determining whether a policy will work in practice. Stressing the importance of currency competition acknowledges that men may use the reigns of power in ways that run counter to the public welfare and that external—credible—checks are necessary.